The yellow wild mustard blossoms are happening now in the Napa valley. After our trip to Yosemite we headed to Calistoga for a few days to capture shots of the mustard blooming in the Napa Valley. California is such a great state - one day you can be in a winter storm in Yosemite, and the next you can be in the warm and wonderful wine country enjoying wildflowers. On Monday evening we experienced a few rain showers while the sun was shining - which is perfect "rainbow weather". Sure enough, in one of my favorite vistas along Silverado Trail a massive brilliant rainbow appeared over old vines and blooming mustard. It was raining but some shots are worth taking the Hasselblad out in the rain for, and this was one of them. The image below is a stitched panorama of 4 frames taken with the 35mm lens. The rainbow was so large that it took four frames to capture the entire scene. I relied on PTGui pro to stitch this fairly complicated panorama together, since the rainbow had to line up perfectly in all the frames. People were stopping along the road asking for my business card since they wanted prints of this amazing scene. I am glad I had the camera in the car - rainbow pictures are a chance occurrence that are hard to plan ahead for. 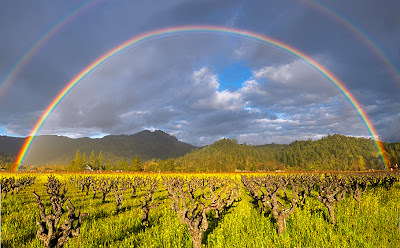 Please visit my website to view Napa Valley Rainbow in a larger size.